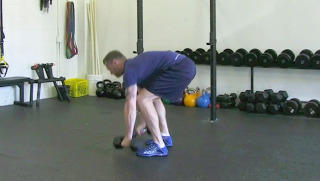 The dumbbell burpee press is a strength and conditioning exercise that targets the shoulders and legs. 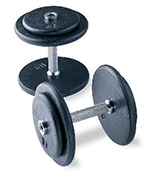 The dumbbell, a type of free weight, is a piece of equipment used in weight training. It can be used individually or in pairs (one for each hand). Dumbbells vary in weight from 3lbs. up to 150lbs. Start in a standing position while holding a dumbbell in each hand. Place the dumbbells on the floor, jump out into a plank position and perform a push-up. 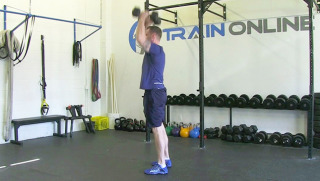 Jump back up to the starting position and press both dumbbells overhead.